Chinook Salmon Fishing or Smallmouth Bass? Fresh Kings on the Lower Pere Marquette & Manistee River. The Pere Marquette, Big Manistee, and Little Manistee are all beginning to fish well for salmon. Our Salmon crew has been doing well of the past several days. The Lower PM has been the best, casting Thundersticks below Indian Bridge. Float fishing Skein under a bobber has been working well on the Manistee Rivers, producing some nice chromers! Cooler nights and rains have been steadily bringing in salmon into all of the lower rivers. Everything seems to be ahead of schedule of last season. Salmon are bigger this year. Big Lake reports are awesome for the upcoming season. The last couple of days on the lower PM and little Manistee River has been outstanding! The Little Manistee River is loaded with big, bright kings at this time. Casting spinners has been very productive with lots of hook ups each day! A summer with more than average rain fall has proved so far, to make for outstanding king salmon fishing. I believe higher water levels will make for an earlier than normal migration in all west Michigan Rivers but more so on the PM and Manistee. Lately, Fishing fresh skein under a float has proven very effective. Casting Thundersticks or crank baits at first light has been producing a lot of salmon for us so far. The Big Manistee River, at the mouth of both Bear Creek and Pine Creek, has been producing fresh bullet kings each morning for us. I personally focus most on the lower Pere Marquette salmon below Indian Bridge. The Little Manistee River seems to have the most salmon so far. We will keep you updated as to how the season is progressing. We have some availability right now for 5 guides on the Muskegon, Pere Marquette, and Big Manistee River. If you have a date or several in mind, please feel free to text me or use the “Book Now” tab of the website. Michigan Salmon trips in less than one month!! Chinook Salmon Season – 2014 on the Pere Marquette, Manistee, and Muskegon Rivers!! It’s sure to be a year to remember! Last year’s King salmon were the largest year class in over 30 years! Don’t miss out! Atlantic Salmon in Northern Michigan. We’ve been spending the last few days chasing Atlantic salmon in Northern Michigan. These fish have been incredible fighters on the fly rod! Holy cow do these fish have power to burn with huge jumps! Best techniques for these fish have been either centerpin float fishing or fly fishing with nymphs under a strike indicator. Atlantic salmon absolutely crush flies and are actually BITING the flies, no floss jobs with these fish!! We are entertaining the idea of guiding for these salmon located in Northern Michigan. Fishing trips for these should be available for next summer, 2015, for both myself and Alyssa. To learn more about these fish and what we do for them, please check out our Facebook guide page and leave us comments or your thoughts on these great fish. They offer exceptional angling opportunities and great table fare in an enjoyable setting! Cooler temperatures this week have made for some great Trout and Smallmouth Bass fishing on the Muskegon River, Pere Marquette, and Manistee Rivers. Check out some of the photos from this week! Also note that we are less than 6 weeks away from Salmon fishing on the Pere Marquette and Big Manistee River. It’s going to be and incredible salmon season this fall. Fish are HUGE on the big lake this year!! Caddis offer some great dry fly fishing during the summer months. At times, caddis consist of 80% of a trout’s diet. Trout love caddis pupa, emergers, and adults. Michigan evening hatch fishing trips – $250 for evening specials. 5pm – 10pm. Shawna and John display a huge Smallmouth from Shang-Ra-La section on the Muskegon River. Trophy Smallmouth Bass fishing during July & August. Over the last several days, we’ve had some rain and cooler than average nights. Cooler water tempratures make for some outstanding trout fishing on the Muskegon and Big Manistee River. Some great hatches like Isonychia, light Cahills, ever present Caddis. Decent Caddis emergence each evening between 7pm – 10pm on both rivers. Guided Bass trips take place during the middle of the day into the evenings. Smallmouth have a unique habit of feeding almost exclusively on crayfish and are sight feeders. They seem to feed best during the middle of the day and into the evenings. Top water seems best going into the evenings with the sun behind the trees. Hot and humid weather means one thing in Michigan fishing trips, Smallmouth Bass! When water gets on the warm side during July and August, Smallmouth Bass get fired up! The Muskegon River abounds with Smallies all summer long. They are aggressive and fight super hard with long digging runs and lots of jumps, these guys are a blast to fish for and catch! We use several techniques for Smallmouth bass. Our favorite is light spinning tackle or bait casters with small crank baits, top water lures, or soft plastics. Top water lures are fun because the strikes are vicious and heart stopping! Smallies absolutely smash top water lures and love to chase lures in small packs of two or three fish. See fish strike!! We have several locations on the Muskegon where we guide for Smallies. We also have a trophy section where we catch larger Smallmouth, Pike, Musky, walleye, Largemouth bass, and catfish. It’s a very action packed guided trip with lots going on! Bass is our main target but other species are often caught as well. This trophy section is very secluded with few homes, scenic beauty, and near zero boat traffic.Muskegon River Smallmouth Bass article. Great Brown Trout fishing on Michigan Rivers. Great hatches such as caddis and may flies. Fishing had been outstanding with cooler weather this summer. There are a couple things that really stand out about warm water species such as smallmouth, pike, and pan fish. When you find them, usually there are many. Making for face paced action. Who doesnt like to catch a lot of fish? Smallmouth and pike also love top water!! Explosive strikes, big misses and they come back to hit it again! River conditions normally have clear water and optimal visibility allowing anglers to see bass and pike chase the fly or lure. Nothing is more exhilarating the seeing a giant Northern giving chase to your surface lure!! Come join us for some great fishing!! Smallmouth Bass fishing has been heating up!! Tempratures are rising along with great warm water species. Bass, Pike, Walleye, and pan fish are now the flavor of the month. Warm water species offer some really good angling opportunities for the next month, at least as long as the weather is hot and humid. Water levels and temps are perfect right now. Northern Pike are also a blast on top water! Smallmouth Bass is heating up!! Catch big fish! This could be the year or years for Skamania Steelhead! After the year class of winter – spring steelhead that we had this year with much larger than average size, we could be in store for some monster summer steelhead! 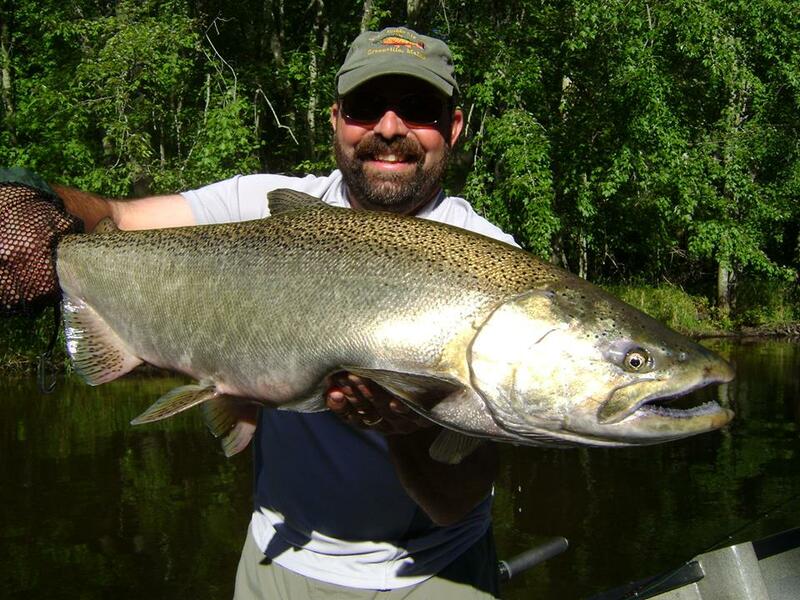 Both the Big Manistee, Muskegon, and St. Joseph rivers get decent runs of summer steelhead. These hatchery steelhead make their migrations based on sunlight, and migrate around summer solstice. They usually arrive in the rivers in good numbers around the fourth of July. Skamania steelhead love to hang out at creek mouths. We fish Skamania steelhead a varity of different ways. Our two favorites or float fishing with spawn or half a crawler, the other is fly fishing. Skamania are suckers for a good fly pattern. They love stones flies and other large nymph patterns. Swung spey flies are another good option. They love to chase flies! Summer run steelhead are incredible fighters with long runs and incredible jumps! They readily take a fly or other offerings and are a bit more aggressive than other steelhead. Unlike spring steelhead, Skamania steelhead are a planted, hatchery strain of steelhead so there is no issue with keeping them. The offer exceptional table fare, on the grill or smoked. We offer guided Skamania trips on the Manistee, Muskegon, and St. Joe river, which probably has the strongest run anywhere in the State. Indiana also has big numbers of summer runs. Trail Creek has one of the biggest. The Manistee Below Tippy Dam also receives a big run of summer run steelhead. Outstanding Trout fishing during the summer months! We are now starting to see a few Skamania Steelhead on the Big Manistee and St. Joseph Rivers. These fish are a riot if you ever hooked one!! Extreme high jumps and scorching runs!! Wow! Skamania, summer run Steelhead are amazing!